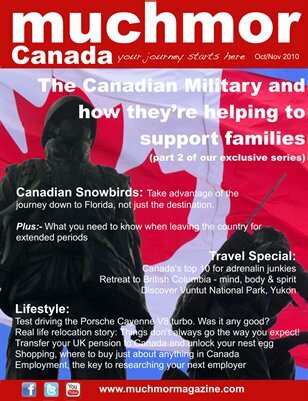 Canadian lifestyle and travel magazine. Contents include: snowbirds heading south for the winter, destinations to visit on the way. Retreat to British Columbia, Vuntut National Park, Yukon and Canada's top thrill for adrenalin junkies. Where to buy just about anything in Canada, What you need to know when thinking of becoming a snowbird. Employment: how to research future employers and how not to look unemployed. Realty: Buying real estate and saving on energy bills. Motoring: test drive the Porsche Cayenne V8 Turbo. Community: Peterborough, Ontario welcomes you, Culture and diversity ay Smiths Falls, Greater Sudbury a multicultural mosaic. How the military support families relocating across the country. Immigration: Transferring a UK pension to Canada, choosing the right community, Lunenberg, Nova Scotia, Real life story of relocating to Canada, immigration news.